… otherwise known as the 2nd Beer Belly Run from the Grey Horse pub in Consett raising funds for Motor Neurone Disease. This has to be said is a ridiculous concept, one that we have inherited from America. The idea is that runners do 5 x 1K laps around a pub, after each lap you down a half of beer until the last lap when you down a pint. Thankfully I was driving and so was excused the beer swilling however the landlady did give me a glass of wine at the finish. The entry form said that fancy dress was “positively encouraged” so Paul and I joined the throng – me as Adam Ant in ‘Dandy Highwayman’ mode and Paul as a Beverley Hillbilly. If you weren’t around in the ‘60s Paul’s outfit will be a mystery to you! There were some cracking costumes – Harry Potter characters, Freddy Mercury, a zombie with a rubber mask, Elvis and a man in drag with enormous false breasts to name but a few! The fancy dress prize went to a bloke wearing hideous white Y-fronts with a towel stuffed down the front, he had a knotted hankie on his head, he ran in wellies and he had a brown ‘skid mark’ painted on the back of his pants with some toilet paper hanging out of the waist band. Gross but hilarious! Blackhill Bounders had a few serious runners in it to compete for the prizes – even so I think I might have been second lady! Paul & I certainly finished quite high up … which might give you an idea of the standard. Afterwards there was a buffet and 2 bands were due to play during the evening. We left after the buffet but it was a very enjoyable afternoon and an entirely fun event. 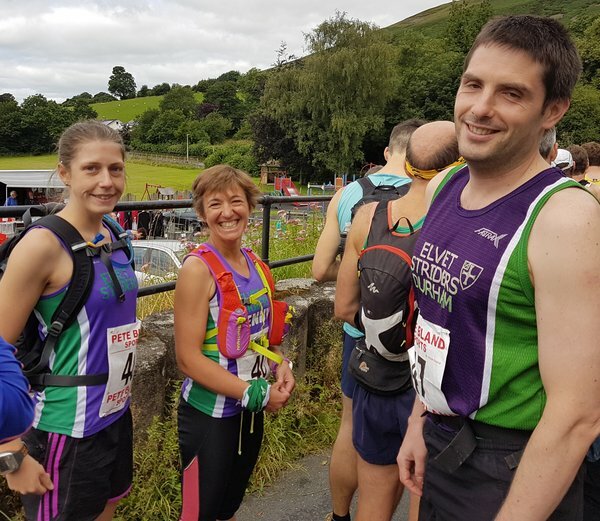 The inaugural event was last year to raise money for Parkinsons UK – a local teacher, Nigel Nattress had been diagnosed with the disease and the pub organised a series of events to raise money for the charity. The final sum raised was £5000+. 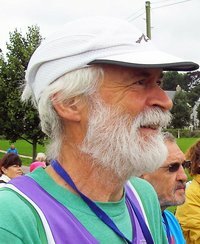 Unfortunately, Nigel had been misdiagnosed – he actually had Motor Neurone Disease and died in the spring of this year. He was only in his 40s. So this year the pub continues fund raising – this time for the MND charity and Marie Curie nursing. The pub raised £500 on Sunday alone. Some students from Longfield School in Darlington, where Nigel taught have raised £2000 in a sponsored sky dive. The run might have been quite silly, great fun but in a very worthy cause. "It's a wonderful day in the West Dales" I tell myself as the wind and rain slam into my body so hard that it makes me stumble on the final ascent of Randygill Top (624m). The rain feels like needles on my face as I pump my legs up the steep bank with my hands pushing my legs down to help power me upwards. Any fatigue and pain in my muscles hidden by the pain; all my clothing had long since been soaked through. The day had started with optimism, Mike Hughes and I discussing in the back of the car the likelihood of good weather during the race. As we got closer to Ravenstonedale the weather got steadily worse until it was clear the rain was set in for the day. When we reached the agricultural show, the race was starting from, we found registration in a metal horsebox next to the start line and a couple tents were set up next to the horsebox for runners to hide under. We retired to the car to change with both Geoff and I opting to wear our vests and numbers over rain jackets with Mike and Susan opting to wear theirs underneath and flash their numbers at the marshals as they ran by. Suddenly the land dropped away with a steep descent and an equally steep ascent up a rough grass track with muddy foot holes worn in. 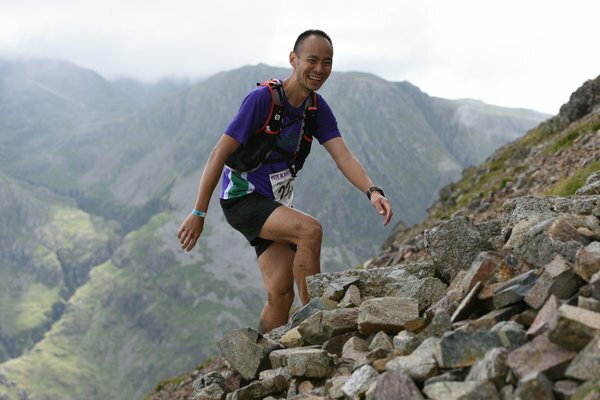 Fortunately, however, the climb didn't last too long and soon I was shouting (the wind was very loud) my number at the marshals while trying to run off in the wrong direction with another runner called Brian, we were soon pointed East towards Green Bell (605m). The wind that had been in my face the whole climb was now at my back and I was able to stride downhill and then was blown the whole way up to the top of Green Bell. After Green Bell the descent started in earnest. It was glorious, a chance to stride downhill over grass and rocky tracks, that were more like fast-running becks. This is where the true fell runners I had been ahead of up to then gained twenty or so yards. When we got back to the mile or so "cross country" section that had been the start I had to stop twice to tie my shoelaces and lost a minute or so and two hard earned places. 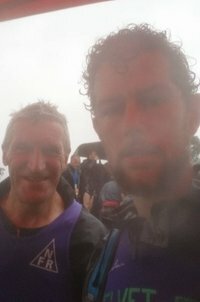 At this point I had been running in tough (to say the least) conditions for over an hour and was beginning to run out of puff. I had been feeling strong up until this point but now was feeling the fatigue set in. Lucky for me it wasn't far to the finish line, even though the last hundred metres was uphill and I finished in 1hr 16m (and 19s). After a quick jog to Geoff and Susan's car I grabbed my phone and went back to the start line to see if I photo the other's finishing moments. There was no point changing clothes as the rain was still heavy enough that anything I put on would have been drenched before I made it back to the car again. I found Geoff had already finished and we waited for the other two. Soon Susan came storming (which seemed appropriate) through to the finish line and at the same time the tent was blown from above myself and Geoff's heads, narrowly missing a woman with a child in her arms. Mike came over the line half a minute later. Then after warming up, drying off and some food we head for home. 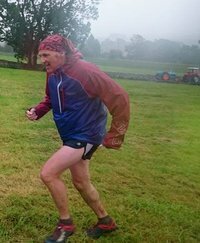 The conditions had been a through test of determination and fitness but I never gave up and thoroughly enjoyed every moment of what was my first proper fell race (Swaledale doesn't count apparently). For the first time in ages I've felt recently that I had some sort of form returning. Perhaps it was time to try an 'AL'. Haven't done one for years. Find out what sort of shape I'm in. Well, now I know. Still, at least you get a prize for being last. Penny was 3rd Lady. Dougie got a prize for "bringing up the rear"
We chose this race partly because we had never heard of it before, it was held in a part of the Lakes seldom visited by tourist hordes; the alternative 'Cross Bay Challenge' looked too flat (with a chance of drowning); and a relative living nearby could be visited; also the course profile; 6miles lumpy up and down, 6miles totally flat, followed by a killer climb and descent in the last mile seemed like a challenge too good to refuse; and my last official half-marathon race was the GNR in 1995! No sign of the 'Cross-Bayers' today as it was so windy the sands had shifted and their start was relocated to Silverdale just out of sight behind the Cartmel penninsula. 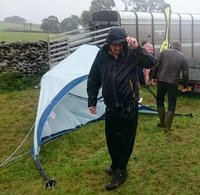 The strength of the wind also defeated the organisers of the Hoad Hill races who had to abandon plans for entertainment and refreshment marquees in the park. Nice views over Bardsea village before we dropped down a steep rock-strewn lane to the coast, through the garden of someone's Stately Home and turning north along the coastal path; sometimes on hard track; sometimes on soft sand; other-times large rounded pebbles; several miles of playing cat and mouse with other runner's strengths and weaknesses; some like uphill; some like downhill; I was comprehensively thrashed by a lady from Dunstable (just visiting, she said) who clearly liked the flat terrain along the coast and then disappeared into the distance once we got to the canal just after the sponsor (GlaxoSmithKline)'s factory. The Canal; completely flat, completely straight; how can a distance just over 1 mile seem like it takes forever? 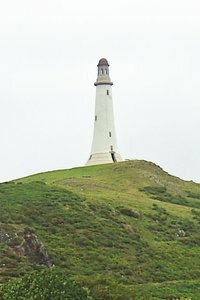 A few twists and turns on country lanes, crossing the main A590 road under Police guidance, and enter the park to climb the switchback path towards the Sir John Barrow monument on Hoad Hill. Pass by one casualty of exhaustion/dehydration/overexertion laid out beside the path but efficiently attended by concerned runners and marshalls, all in radio contact with Race Organisers/Emergency Services and reading details off the back of her race number (did we all fill that in before starting the race?). Onwards and upwards becomes a test of resolve to see who would break into a walk last of all; I give in early to temptation, but can walk as fast as most around me can run so no big deal there apart from young 'Ben' who has a fan-club waiting at the top of the hill and is compelled to overtake. Pass by another handful of runners laid out around the base of the monument with cramp, some in tears, some having their legs pulled (literally) by sympathetic marshalls; I catch up and get past Ben on the downhill stretch but the sprint (ha!) finish into the long funnel back into the park brings on cramp for me and Ben has it in the bag. Not the cheapest run I've ever entered, but well organised, well marked, loads of bananas, and a nice introduction to places I would never otherwise have seen (campervan owners can contact me about an interesting wildcamping location spotted on this run). Oh! and the T-shirt? ; you'll see me and Mike coming from a long, long, way away! I was stood in a field in Rosthwaite, a tranquil village nestled amongst the central fells of the Lake District. "Hello Danny!". I looked up to see a familiar face, it was Trevor Matty from Dark Peak. Last year, we hobbled together, cramping up in agony as we made our way to the final checkpoint. We never made it in time for the cut-off and rode the "bus of shame" to the finish. This year, we were back with a score. I was apprehensive as I left home, but had a bit of a morale boost when I bumped into Striders Geoff, Susan, Jules, Steph & Mike H at Penrith service station. The first mile of the race resembled the Great North Run with jostling and walking as the horde crammed through narrow gates. But it wasn't long before track became footpath then trod. As we passed the final gate, Billy Bland (the record holder of 35 years) was stood there holding it open for us. What a treat it was to see a legend in the flesh albeit it briefly. As we climbed up Bessyboot, there was lots of enthusiastic overtaking, but I was wiser from last year. This was a race you didn't want to overcook. I held myself back and followed a runner who was keeping a sensible pace. I was too terrified last year to enjoy this, but once you got the knack it was really fun, sliding your way down. Each step you took threatened to set off a mini avalanche and once in a while, there would be a shout of "watch out" as a boulder would loosen and roll downhill. Thanks to Aaron Gourley's tip, I had a pair of gaiters which saved me from picking rocks out of my shoes. It was over too soon and now I had to traverse the "corridor route" which was really scenic but there were a few bits where you had to be careful with a few precipitous drops. Before long I was at the foot of Great Gable, her intimidating profile looming overhead. I made the climb up at a steady pace. It seemed to go on forever but it was only 30 minutes before reaching the top. Here, I passed Trevor who seemed to be good spirits, I wished him well and pushed on ahead. The final climb up Dalehead wasn't as bad as I thought and my legs though tired still had energy. After tagging the summit & was a steep grassy drop into the valley with no definite path. I disagreed with the line a Calder Valley runner took and thought I'd be clever by taking a direct but insanely steep approach down. So here I was trampling downhill like an arse (and landing on it a few times too!) whilst everyone else followed her whilst staying upright. In the end, there was little difference (minus my dignity) as we reached Dalehead Tarn at the same time. After navigating a slate quarry, the Rosthwaite finally came into view below. What a welcome sight! The final mile was all downhill and I mustered enough energy to go on the offensive, picking off several runners before crossing the finish line. What a race! If you're into fells, I'd strongly recommend it as it is has everything; distance, terrain, technicality and pace to challenge you. 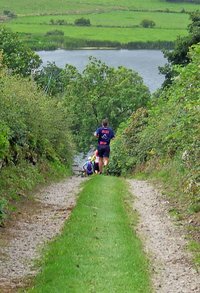 But if you're not familiar with this part of the Lakes, make sure you recce it!